Being the research-driven types, we knew that raising chickens would involve some less than pretty aspects. Like cleaning up lots of poop. And dealing with vermin who want to share in the chicken feed. And finding those vermin dead in rat traps before 7am. We knew that our chickens would die. We (the Royal we) just weren’t prepared for how sad we would be. 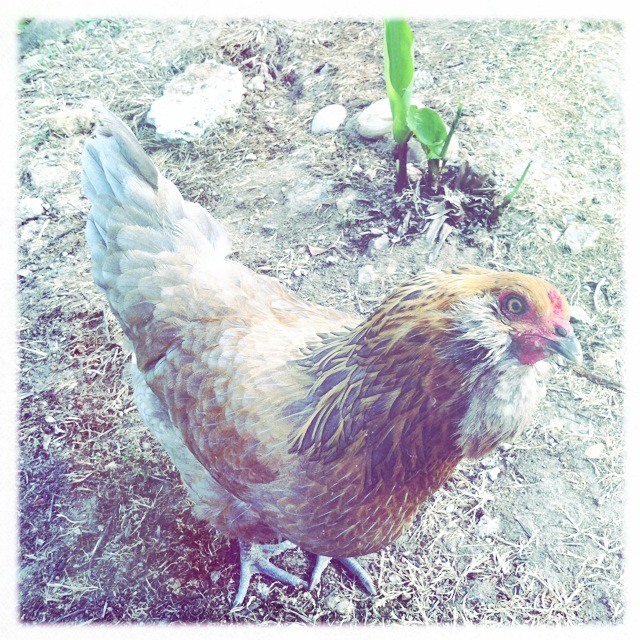 I’m just saying, four months post-partum is a rough time to lose one’s favorite hen. Lavender Blue Dilly Dilly passed away on January 23, 2014. It shouldn’t have been so hard, but it was Lavender. Of all of our ladies, it had to be my Lavvie. She was gentle, beautiful, and a joy to watch. I’ve already waxed poetic about her beautiful blue eggs. They were divine. On the 22nd she was lethargic. On the 23rd she was dead. Just like that. I was lucky enough to have my cousin visiting when it happened and he heroically offered to remove Lavender from the coop. Did I mention he’s 17 and has no experience with chickens or dead animals? A hero I tell you. And then lucky for him another friend came by who DOES have experience with chickens and dead animals and she heroically removed Lavender from the coop and spared me from having to do the dirty work myself. Am I a wimp? Yes. In my defense there were a lot of hormones involved and I was more than willing to take on the task of diverting the kids’ attention away from the coop. I spent the rest of the day being sad and thinking fond thoughts of my lovely lady. With time I’ve come to realize that as far as the chicken life goes, she had it pretty good. But I still miss her.